Dubai, UAE, April 27, 2016: Independent five-star luxury hotel operator, Shaza Hotels unveiled their forthcoming projects and plans at this year’s editions of the Arabian Travel Market ( ATM; 25th-28thApril) and the Arabian Hotel Investment Conference (AHIC; 26th – 28th April). The first hotel chain to infuse Arabian cultures and values in a contemporary and luxurious setting announced the opening of six new hotels across the Middle East between 2016 and 2019 in addition to its existing Shaza Al Madina in the Kingdom of Saudi Arabia. At the Arabian Travel Market, Sheikh Salem bin Ahmed Al Ghazali, Chairman of Golden Group of Companies, and Mr. Salman Al Mohannadi, Chairman of Shaza Hotels also signed an agreement of management for the new ‘Shaza Muscat’ that will comprise of 250 hotel rooms and 150 hotel apartments, as part of a mixed – use development. The hotel will be welcoming its first guests in the third quarter of 2019. The contract was signed in the presence of His Excellency Sheikh Mohammed Bin Abdullah Al Qatabi, Sultanate of Oman Ambassador to the United Arab Emirates, and His Excellency Hadi bin Nasser Mansour Al-Hajri, Qatar’s Ambassador to the UAE, Mr. Simon Coombs, CEO of Shaza Hotels and Mr. Suleiman Al Harthy, CEO of Taameer Investment SAOC, one of Oman's leading investment companies, along with top management of Shaza Hotels, Mr. Sanjiv Malhotra (Executive Vice President) and Mr. Chris Nader (Vice President for Development). Further, identifying an opportunity to offer Arabian lifestyle in an upscale environment, the brand is launching Mysk by Shaza, a four star experience with its flagship hotel opening in March 2017 in Al Mouj, Muscat. Inspired by the Arabic pronunciation of musk, Mysk carries the fragrance of Shaza into a renewed and festive worldliness. Like its parent, Mysk is born out of the Middle Eastern culture, awakening the senses with its enchanting aroma, and creating a theatrical experience that is closely tied to the rich and ever evolving Arabian culture. The years 2016 and 2017 are a key milestone in the expansion plan of Shaza Hotels and Mysk by Shaza. 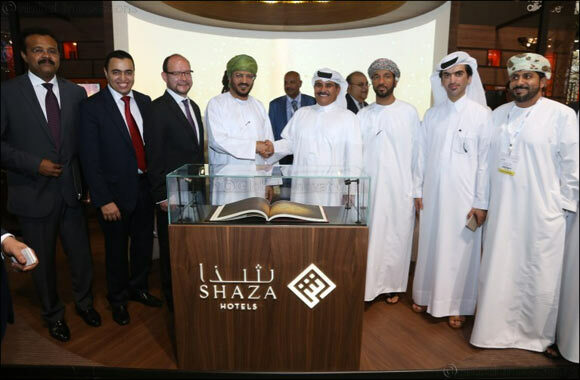 The 3rd quarter of 2016 will witness the grand opening of Shaza Hotel in Makkah. In addition, negotiations are underway for new Shaza projects in Europe which marks an important new chapter for the brand outside the Middle-East. Further to the launch of Mysk by Shaza in 2016, 5 hotels are to be signed in the region by the end of 2017, including 2 projects currently under negotiation in the Kingdom of Saudi Arabia. Commenting on the chain’s ground-breaking projects in the pipeline, Mr. Simon Coombs, CEO of Shaza Hotelssaid, “2016 is definitely a landmark year for Shaza Hotels and we are excited to be unveiling our imminent projects across the Middle East. In a meaningful partnership and dialogue with our owners, we take pride in creating each Shaza Hotel to be a bespoke experience where we deliver the highest standards to our guests. I am now very excited to extend this experience to our new brand Mysk by Shaza. Shaza is a member of the Global Hotel Alliance (“GHA”), the world’s largest alliance of independent hotel brands.Born out of a joint venture between Kempinski Hotels and Barwa Real Estate Group, Shaza Hotels is the first international five-star luxury hotel brand to draw its inspiration and character entirely from the Middle East, North Africa, and the former Ottoman regions. In design, services, and people philosophy, Shaza reflects the region’s cultures with understanding and sincerity. A five star contemporary breath of fresh air,Shaza celebrates the past in a present-day setting with tradition being a significant part of the Shaza essence. Shaza prides itself in creating handcrafted guest experiencesthat are both memorable and impactful.